Posted under Health Guides. Updated 31 January 2018. Diabetes is a chronic (long-term) condition that occurs when your body doesn’t make enough insulin, or when your body has trouble using the insulin that it does make. About 1 in 400 young people have this condition. What is insulin? Why is it important? Insulin is a hormone made by a gland called the pancreas. The pancreas is located behind the stomach. Whenever you eat food, your body digests the food (breaks it down) into vitamins, minerals, sugar (called “glucose”), fat, and protein. Your body then uses glucose for energy. Glucose is the body’s major source of energy. Insulin is the hormone that helps glucose enter the cells of your body so it can be used as energy. If your body doesn’t make enough insulin, or if your body has difficulty using the insulin that it makes, the glucose from your food does not get changed into energy. Instead, the glucose stays in your blood, causing your blood glucose (also called “blood sugar”) to rise. Why is high blood sugar a problem? High blood sugar is a problem because it can cause serious damage to the body. Some of the most serious, long term problems are loss of vision, kidney problems, heart problems, damage to circulation and stroke. This kind of damage happens slowly over many years and can be delayed or prevented if you take good care of your diabetes. There are also short-term problems that come from high blood sugar. If your blood sugar gets too high due to not having enough insulin, you can experience a very serious condition called *diabetic ketoacidosis. *Diabetic ketoacidosis is life-threatening and requires emergency medical treatment. If I stop eating sugary foods, will my diabetes go away? No. The glucose that your body uses for energy comes from many kinds of food, not just sugary foods. In fact, the major source of glucose for the body is not from sugar at all, but from foods such as cereal, bread, rice, pasta, and other grains. These foods are called carbohydrates. Dairy products, fruits, and vegetables all contain carbohydrates as well. Carbohydrates are necessary to give your body enough energy to make it through the day. For this reason, it’s important for you to eat a balanced diet that includes moderate amounts of carbohydrate containing foods. How did I get diabetes? The two most common types of diabetes are type I and type II. Type I diabetes is the kind of diabetes most commonly found in young people. Type I diabetes is an autoimmune disease caused by the body’s immune system (the disease fighting part of your body) attacking the cells of the pancreas that make insulin. There are some genes (information in your cells that usually come from mom or dad) that make a person more likely to develop type I diabetes. Even if you have a gene that makes you more likely to get diabetes, there probably still has to be another event that upsets and “activates” the immune system. The immune system then attacks and destroys the beta cells (insulin producing cells) of the pancreas. This stops your body from being able to make insulin on its own, and you get type I diabetes. Once you develop type I diabetes it never goes away. There is no cure for diabetes at this time. To stay healthy, you must take insulin shots or use an insulin pump every day to help your body use the sugars in your food. People with type I diabetes can live long and healthy lives if they take their insulin and keep their blood sugars under control. Type II diabetes is most common in adults, but more teens have type II diabetes now than ever before. You get type II diabetes when you develop “insulin resistance,” which means that your body needs higher than usual amounts of insulin because it cannot use the insulin efficiently and you are not able to make enough extra insulin to keep blood sugars normal. You are most likely to develop type II diabetes if you have a family history of diabetes and are overweight. With type II diabetes, you can often keep your blood sugar under control by eating a healthy diet, exercising, and taking pills that help your body to either make more insulin or do a better job using the insulin that it already makes. Sometimes people with type II diabetes also need to take insulin shots to keep their blood sugar under control. What are the symptoms of Type I diabetes? Many teens with Type II diabetes have no symptoms, which is why if you are overweight and at risk for diabetes, your health care provider will do lab tests to screen for diabetes every couple of years. Doctors can diagnose diabetes through a blood or urine test. 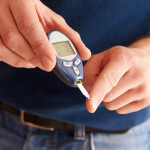 How do I keep my blood sugar under control? For people with type I diabetes, you must keep your blood sugar under control by taking insulin injections or using an insulin pump. This is because your body cannot make its own insulin. eating a healthy diet is also very important for keeping your blood sugar under control. For people with type II diabetes, a healthy diet, regular exercise, and oral medication (pills) are often enough to help keep your blood sugar at a healthy level. There are many different types of insulin and several different ways that you can take it. “Short-acting insulin” starts working very quickly and only stays in your body for a few hours. “Long-acting insulin” takes several hours to start working and stays in your body for as long as 24 hours. You may need only one kind of insulin, or you may need a combination of short and long-acting insulins. An insulin pen: The insulin pen looks like a large pen. It’s filled with insulin and is used with disposable needle tips. An insulin pump: “The pump” delivers insulin continuously just under the skin. It is a small device (about the size of a pager) that you wear all day long. It gives you insulin throughout the day through a tiny needle. Many young people with diabetes choose to use the pump because they feel it gives them more freedom than other methods do. You and your health care provider will work together to find the insulin therapy that is best for you. A member of your health care team will teach you the right way to use whatever method(s) you choose. Do I have to follow a special diet? For both type I and type II diabetes it is important to eat a healthy, balanced diet. You will work together with your health care provider and usually a dietitian to choose an eating plan that’s right for you. You will learn about how different foods affect your blood sugar and about how to choose foods that will help keep your blood sugar at a healthy level all day long. Exercise is an important part of keeping your body healthy and your blood sugar at a healthy level. Your health care provider will work with you on an exercise plan. It’s important to talk with your provider about sports and exercise because they can have a big effect on the way your body uses insulin, and on your blood sugars. People who take insulin can sometimes have low blood sugars during and after exercise. How do I check my blood sugar? You’ll need to check your blood sugar several times each day using a special device called a glucose monitor (or “glucometer“). Your glucose monitor will tell you whether your blood sugar is too high, too low, or within your target range by measuring the amount of sugar in a tiny sample of blood. The blood sample is taken by pricking your finger or inner arm with a very thin needle called a lancet. Your health care provider will teach you how to use your glucose monitor and how to keep track of your blood sugars in a log-book or an app that you will bring to your appointments. Keeping track of your numbers will help you and your provider see changes in your blood sugar levels over time. This can help you to notice any patterns in your blood sugar, which can help you and your health care provider to decide whether you need to make any changes to your insulin doses. Some people with diabetes wear a continuous glucose monitor that measures the glucose levels in the skin layer every few minutes throughout the day. What if my blood sugar is too high? Talk with your health care provider about what to do if your blood sugar is too high (called hyperglycemia). You might need to take an extra shot of insulin, or, if your blood sugar is extremely high, you may need medical help. What if my blood sugar is too low? If your blood sugar is too low (called hypoglycemia), you’ll need to eat or drink some sugar to “spike” your blood sugar back up. You might have glucose tablets for this purpose, or you might have a sugary drink like soda or juice. You should always carry a source of sugar with you in case your blood sugar drops. If your blood sugar is very low, you could pass out and need emergency medical help. For this reason you should always carry a card or wear a bracelet or necklace that lets people know that you have diabetes. This will help you get the proper treatment right away. If you feel like you have low blood sugar, but you are not able to check your blood sugar, you should eat your glucose tablets or drink some soda/juice just to be safe, then check your blood sugar as soon as you can. It’s important to treat low blood sugar right away. What is the diabetes “honeymoon period”? Although diabetes never goes away, many people with Type I diabetes experience a “honeymoon period” soon after they find out they have the disease. During this time, which typically lasts between a few months and a year, a person may need little insulin to have normal blood glucose levels. This is because their body is still making some insulin. As the diabetes progresses, the person will slowly make less insulin until their body stops making it altogether. At this point they’ll need to rely on regular doses of insulin. Diabetes is serious because it never goes away and because you must take proper care of yourself to stay healthy. However, that doesn’t mean you can’t live a normal life! People with diabetes can do almost anything that people without diabetes can do. You just need to take special care with your diet, exercise, and medication in a way that other people your age might not need to. The longer you have diabetes, the higher your risk for certain problems such as heart disease, poor vision, kidney disease, and circulatory problems. The better you keep your blood sugar under control, the better chance you have of delaying or preventing these problems when you’re older. Who can help me take care of my diabetes? It takes a team to take care of diabetes: at home you work with your parents or the adults you live with to make sure you get your insulin injections, monitor your blood sugars, and eat regular meals. At school, the school nurse may help out. The nurses, doctors, nutritionists, and counselors who help you take care of your diabetes are part of your team too! You should feel comfortable talking to any one of them about worries that you might have. It’s important to do the best you can to keep your body healthy and your blood sugar under control. For young people, this can be a challenge. The changes in your hormones at puberty can sometimes make it hard to keep your blood sugar under tight control and this can be frustrating. It can also feel frustrating to have to think so much about food and your blood sugar while most other people your age don’t have to worry about it. If you’re feeling overwhelmed, there are resources available to help you cope with your diabetes. It might help you to talk with someone who understands what you’re going through. Your health care provider or your parents can help you find a counselor or support group in your community. Remember that staying healthy includes avoiding smoking and alcohol. This is important for all teens, but especially for teens with diabetes. Smoking can cause serious damage to your circulation, and drinking alcohol can lead to dangerously low blood sugar. Be sure to meet with your health care provider regularly to discuss your progress – if you work together to care for your diabetes, you can look forward to living a normal and healthy life!